Texans love their BBQ, Tex Mex enchiladas, Blue Bell ice cream, and olive oil. Olive oil? The demand for healthier food choices has increased the demand for olive oil in Texas. This rise in consumer demand has inspired the growth of the Texas olive oil industry over the last two decades. 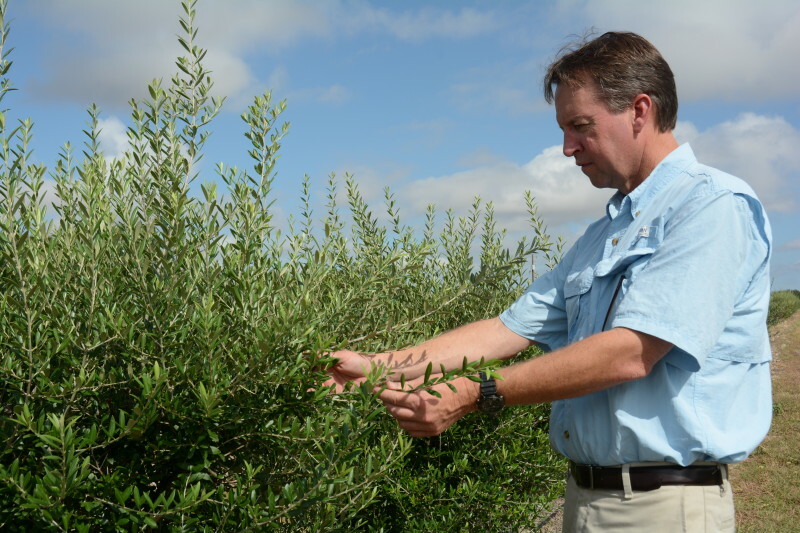 According to the Texas A&M AgriLife Extension Service horticulturalists, nearly 2000 acres of land are producing olive trees native to the Mediterranean. When Curtis Mickan studied what would be best for his land in Williamson County, he learned that the U.S. is the third largest consumer of olive oil in the world, with California being the biggest U.S. producer. “I knew the olive industry was a new thing for Texas, because there weren’t any as far north as Georgetown,” Mickan said. In 2009, he and his grandson, Joe Swanson, broke ground for their Central Olive Oil Ranch. Texas is a hot state, but olive trees are drought resistant. However, they do not do well in freezing temperatures, which poses a challenge in Texas. Monte Nesbitt, Texas A&M AgriLife Extension Service horticulture specialist, examines an olive tree in Central Texas. “Olives are a mediterranean crop. The severe, occasional freezes we get in Texas can be a problem,” Monte Nesbitt, AgriLife Extension horticulturist based in College station, said. He adds that they grow when temperatures reach about 70 degrees in the spring, but they only set fruit after experiencing night temperatures of 35-50 degrees followed by less than 80 degree daytime temperatures. Other challenges include weeds, proper irrigation systems, soil, cotton root rot, and number of trees per acre. Despite the challenges, growers see Texas olive oil production as a profitable industry and are working together to share information, resources, and best practices. Salud de Paloma uses a blend of Texas and California olives to deliver the freshest oils possible. After harvest, the olives are cold-pressed and bottled at Texas Hill Country Olive Co.’s on-site olive mill, bottling, and distribution facility. Check out our YouTube video to see the extra virgin olive oil bottling in action, along with a few views of the hill country! The scenic hill country in Central Texas boasts breathtaking views of its countryside, fabulous attractions and events, world famous wine trails, and fine arts and culture. Texas A&M AgriLife. “Texas producers find new oil fields: Olive groves.” ScienceDaily. www.sciencedaily.com/releases/2014/09/140908083213.htm (accessed December 4, 2014).